Kalpana is only as old as me, but the maturity, responsibility and composure that she displays is unmatchable. She is a mother of two beautiful young kids. Having studied till her 12th standard, she works as a volunteer tutoring about 45 children in her village. She spends a total of 2 hrs per day doing this job, while the rest of the time is utilized to take care of her children, manage the household chores and attend to the cattle. Her husband is a lawyer, earning close to Rs. 8000 per month. In an effort to keep herself busy with something constructive she decided to expand her cattle business by buying a buffalo. 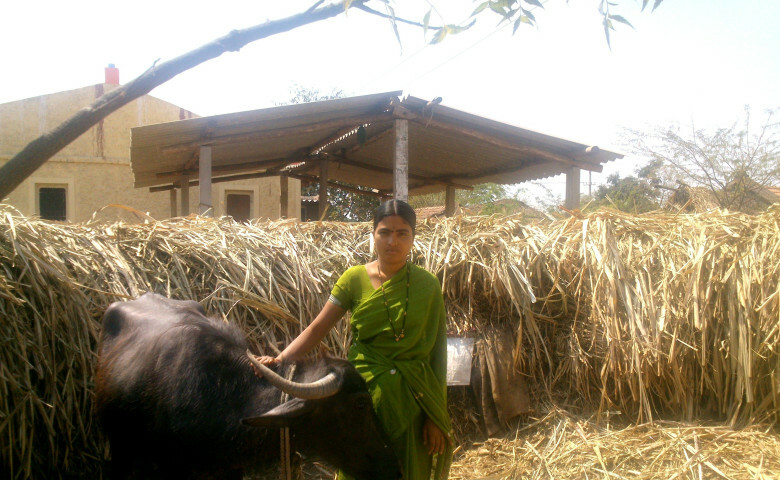 Since the cow is still in its gestation period, Kalpana has to wait for a few months before she makes profit by selling the milk. With expenses close to Rs. 6000 per month, the extra income that she expects to make will help the family pay for some expenses, while saving some money for the future. She is also the leader of a women SHG group in the Morab village, managing the financial accounts of all the group members. To manage all that work so gracefully at that young age it not only takes a lot of skill, but also a lot of maturity. Did this story inspire you? Share your thoughts.